As a classic rock and 80s one-hit-wonder fanatic, I don't listen to pop stations very often. But I've found that when I do, I'll inevitably hear a song that ripped off a song I love and mutilated it beyond repair. Sometimes, though, I'll find myself nodding along and realize after a few weeks that I've come to like the new song better than the old one it sampled. And while some of these artists may have obtained permission to use the songs, in my heart they all feel like ripoffs. But here are a few of those that I think are better than the originals, some that you might not even know were sampled in the first place. Fall Out Boy's album American Beauty / American Psycho is one of my favorites of theirs, and it's full of samplings from other songs. The one that almost nobody seems to know is a rip-off, however, is "Centuries." That's right: Fall Out Boy didn't come up with that earworm. Suzanne Vega did. And her song will get stuck in your head for days and days as the entire song follows those same few repeating notes. "Centuries" was definitely an improvement here as there's at least a little variation. To be honest, I hated this song when it first came out. 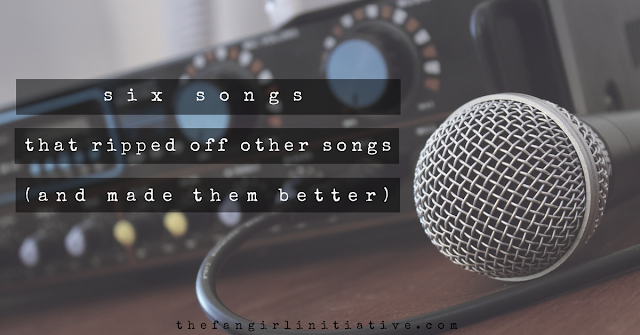 But, like most songs I initially dislike, the more they played it on the radio, the more I came to like it. Then they sampled it in Pitch Perfect and I was sold. But they didn't come up with the idea. Or most of the song, really. "You Spin Me Round" is equally annoying, but with that glorious 80s synth pop sound. I suppose I like both of these equally, but as far as annoying songs go, "Right Round" has a more modern spin (see what I did there?) that's pretty much irresistible. Remember how I said Fall Out Boy was riddled with samplings? "Uma Thurman" has also built its empire on the back of another song. Granted, most people know this one, usually because they're listening to it around their parents who go, "Hey! I know that sound." But I definitely think Fall Out Boy improved this one by, you know, actually making it a song. This catchy tune was an original, fresh sound on the pop music scene. Well, fresh, anyway. Not so original. Gotye put Bonfá on the modern map as evidenced by the fact that a google search brings up nothing but articles linking the two songs. And the fresh take on the music is wonderful. I will forever be a believer, however, that the Star Wars parody will always be the ultimate version of this song. This catchy little tune with a fun music video was Gym Class Heroes's first single and their first hit. Funny what sampling a popular song in a creative way will do. I'm sure everyone knows that "Cupid's Chokehold" samples Supertramp, as they're not shy about admitting it. It's more of a tribute than anything, and to be fair, I love both songs for different reasons. But Gym Class Heroes put their own spin on it, and isn't that what art is all about? This song is one of the ultimate pump-you-up songs. It's in the film Never Back Down, and for a while, it was on every playlist at every party and every gym ever. This song by Daft Punk is not quite as catchy or inspiring as Kanye West's, and as the name suggests, they're really close to being the same. This song is odd, and I didn't actually know it existed until I started writing this article. Similar to "Seville," most of the google results for this song link it to Daft Punk's version. The sounds are oddly similar, and I definitely think that Kanye West's version is the best out of all three. Wow. Never thought I'd hear myself say that. Huh. Did you know these had sampled other songs? Can you think of others that I missed? Most of those I knew! Haha. I will say, as much as the beat for Kanye's Stronger is a massive step up on Daft Punk's, the lyrics aren't. I have a version I listen to that is the beat to Kanye's without the lyrics. It's one of the few Daft Punk/Something Else mashups I listen to. DP's stuff is typically pretty epic on its own.